Introduce yourself to the referee. Ask the referee where he/she is from. It's best to take the initiative and step right up and start talking to the referee. Tell the referee where you are from. 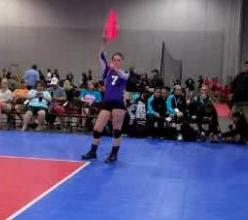 Inform the referee of your experience as a volleyball line judge. If you are working only one set, make sure everyone else who will be calling lines is with you. The referee only wants to go over the line judge duties one time, so make sure all the line judges are present during the discussion. Every time the ball lands near a line that you are responsible for, you should be making a signal. When the ball lands on the ground inside the court, you will signal "in". If the ball contacts the ground outside the court and hasn't been touch by a player on that side of the court, you will signal "out". The court boundary lines are part of the court, so if the ball lands on the line, the correct signal will be "in". It's important to be watching the line, not the ball. If you are watching the ball and not the line, there's a chance you could get the call wrong. This is because you won't have much time to focus on the line as the ball hits the ground. So always remember to get your eyes to the line before the ball lands. Get out of the way of a player. When a player comes near you to make a play, be sure to step out of the way so you don't interfere with play. Another responsibility for the volleyball line judge is watching where the ball crosses the plane of the net. The ball is "out" if the ball crosses outside of, or over either antenna. Also, if the ball contacts the antenna or the body of the net outside the antenna. Point to the antenna with the hand not holding the flag. At the same time, wave the flag over the head with the other hand. This will indicate to the referee that the ball illegally crossed the net. Use the same signal if the server steps on the line at the moment he or she contacts the ball for serve. Point to the line instead of the antenna. Still wave the flag with the other hand. Be sure to make eye contact with the first referee when signaling. Line judges should also help the first referee with touches off the block. The line judge should watch for touches by both the blockers at the net and also the players on the court reaching for the ball. Hold the touch signal for a good length of time to ensure the first referee and all participants see your signal. Signal "out" on the balls that are touched and go out of bounds on the same side as the hitter. 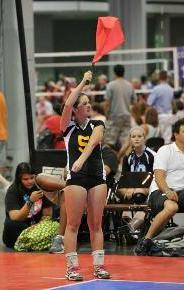 Signal "touch" on the balls that are touched and go out of bounds on the opposite side as the hitter. If a ball is touched then lands "in" the court, always signal "in". Always signal "in" on balls that land "in". Each line judge stands at the intersection of endline and sideline. One volleyball line judge stands to the right of the first referee. The other line judge stands to the right of the second official. During timeouts, line judges move to the center of the end line. Do not pepper with a ball or go to the scorers table to talk to your teammates during timeouts. No phones, ear buds, or iPods during the match. Don't pepper with teammates or sit on the scorers table. Be ready for the next set to begin. Sit in a spectator chair or sit in a chair behind the scorers table if there is one available. Be aware of when the teams take the court for the next set. You want to be ready to go when the line ups are being checked by the second referee. 1. The referee will be looking at you during the match for help. Always be ready to help out. 2. Call everything you see no matter how obvious it might be. Remember, a referee won't always see everything. A referee may not see a ball that lands 3 feet in the court because of being screened from the play. 3. The referee expects you to do a great job, just as you would expect them to also. 5. Always give great signals and really sell your calls. Believe in yourself and be ready to give the signal with authority. 6. When you make the call, be sure to make eye contact with the first referee. This will ensure the referee that you want them to go with your call. 7. If the referee overrules you, don't worry about it. This will happen because sometimes the referee will see things differently. If you are trying your best and always paying attention, the chances of being overruled are much less. 8. The referee expects you to do great and knows you can do a great job. Always stay focused and work well with the referee. The better you work with the referee, the more enjoyable the experience will be. When you are playing, you expect the line judges to stay focused throughout the match. 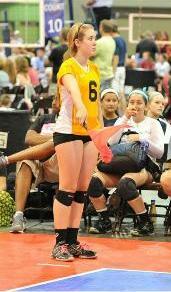 Return the same courtesy when you volleyball line judge. 9. At the end of the match, don't run off without giving the referee an opportunity to thank you. Each referee truly appreciates the time and effort you put into making sure you called the match to the best of your ability.